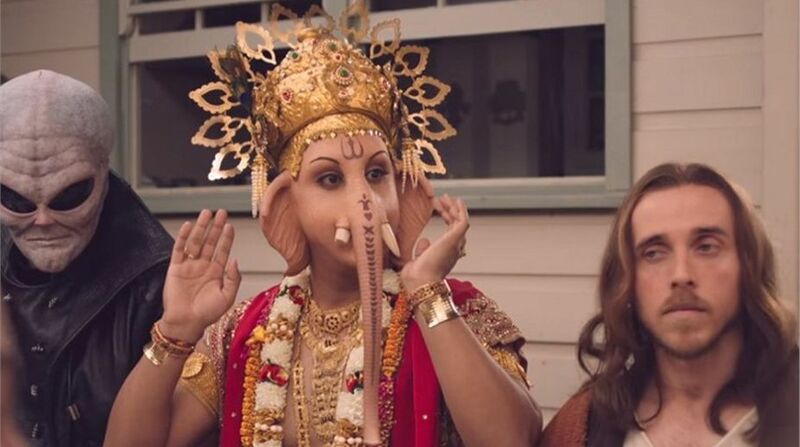 Australian advertising watchdog has dismissed complaints filed by Hindu groups against a controversial advertisement which featured Lord Ganesha in a lamb roast along with several other deities and prophets. Despite numerous complaints lodged by Hindu groups across Australia and globe, the Advertising Standards Bureau’s (ASB) Board said the advertisement was inclusive. The advertisement launched earlier this month by Meat and Livestock Australia (MLA) ran into controversy for its depiction of Ganesha in a lamb roast. The ASB board said the advertisement “does not, in its depiction, provide any one character with less favourable or unfair treatment by virtue of being in the group, nor is the depiction of the group done in a manner that subjects one character to humiliation, intimidation, hatred or ridicule by virtue only of being part of the group meal”. It depicts a “clearly fictional and humorous scene” which unites various divinities, prophets and icons at a dinner table, it said. “The advertisement portrays that, while there are many topics upon which different religions diverge, maybe lamb can bring everyone together,” it said. In reference to specific complaints around the advertisement’s depiction of Ganesha, the MLA said it was their understanding “that the Hindu faith does not forbid meat eating and that, while many Hindus abstain from eating beef (given the sacred nature of the cow to the faith), lamb is not similarly characterised”. The MLA said their decisions were “informed by the actor who played the role of Ganesh who was a practising Hindu man”. The Advertising Standards Board ruled the advertisement did not break any of the Code of Ethics’ guidelines on account of religion. Due to the advertisement’s light-hearted and humorous tone, the Board also ruled depiction of Ganesha was not unfair or less favourable due to his faith and did not vilify the Hindu faith. Over 200 complaints were lodged demanding the advertisement’s withdrawal. The Hindu Council of Australia had called for the advertisement to be banned, saying it was a “crude and deplorable attempt by the MLA to use images of Ganesha to promote lamb consumption”. The Australia India Business Council (AIBC) also expressed concern over the advertisement and said it was culturally insensitive and displayed remarkable naivety about its adverse impact on relationship with India. It said that MLA should abandon using religious deities for promotional/ commercial purposes and demanded immediate withdrawal. Last week, the High Commission of India also issued a statement saying it had made a “demarche” to the Department of Foreign Affairs and Trade, the Department of Communication and the Arts and Department of Agriculture over the “insensitive” advertisement. The statement said the way Lord Ganesha was used for the advertisement was considered by the Indian community to be “offensive and hurting their religious sentiments”. “The Consulate General of India in Sydney has taken up the matter directly with Meat and Livestock Australia and urged them to withdraw the advertisement,” it added.